At Harrah's Lake Tahoe Hotel, you can come out and play and stay at the most welcoming Lake Tahoe accommodations around, a spot that's been entertaining guests in style since 1955. As impressive as the lake itself, the 18-story hotel tower at Harrah's features award-winning guestrooms. 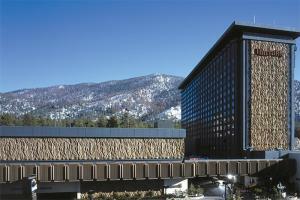 Harrah's Lake Tahoe features a 24 hour casino with everything from video poker to blackjack. Guests can also enjoy a swim in the outdoor pool or massage in the spa.